Did you know that churches and Christian organizations in Canada are not allowed to say anything against homosexuality from their pulpits and periodicals? It's true. And not just Canada, but Sweden, Australia and the United Kingdom also have similar laws. These are not countries ruled by dictatorships, but countries very similar to the United States in its freedoms of speech, religion and democratic processes. These countries are now ruled by the PC (political correctness) police. America may not be far behind in restricting what is said from the pulpit, for such intimidation to the pulpit is indeed alive and well in the United States. For example, to mix the pulpit and elections hasn't been allowed in the United States since 1954 when then-senator Lyndon Baines Johnson offered an amendment to restrict nonprofit organizations, including churches, from endorsing or opposing political candidates. Should a church violate that restriction, the IRS comes down on the church with threats to revoke their non-profit status. Adding a so-called "hate crimes" restriction to the American pulpit is not far-fetched or far away in a society that increasingly calls evil "good." My heart has been burdened since hearing about the plight of our brothers and sisters in Christ just over the open border who would face jail time, fines and revoking of their non-profit status for caring enough to tell the truth. The truth they share is that sexual perversion slowly and painfully kills its practitioners, creates deadly epidemics, produces anarchy destroying the fabric of society, and disturbs the Creator who lovingly created each of us with function and purpose. The preachers are not being punished for hating or discriminating, but for loving and caring. A recent act by some America churches, though, may give the Canadian churches an example to follow concerning how to stand up for their loving message. On September 28, 2008, churches from 20 states took a stand and preached concerning today's issues, what the Bible says about those issues, and applied the Bible's standards to politicians running in the current election. As The Alliance Defense Fund, a conservative legal alliance of Christian attorneys headed by President Alan E. Sears stated, the purpose was to "reclaim their constitutional right (and) from the pulpit" by "advise[ing] their congregation what scripture says about today's issues, applying those issues to the candidates standing for election just like their forefathers did 150 years ago." These churches bravely stood up for their freedoms of religion and speech, and more importantly for the Word of God. I admire such bravery in the face of persecution. Look at history. Where would the civil rights movement had gone if Dr. King and others didn't stand up in the face of adversity for what was right. Where would India be now if Ghandi didn't stand up for what was right. These men faced persecution, jail time, beatings, and ultimately assassinations, but the movements they led brought the truth to light and changed nations for the better. Canadian churches, stand up for the Word of God! Make a plan. Organize a network of churches for one Sunday that will stand at their pulpits and preach that God loves the homosexual and wants them to leave their destructive lifestyle. Get so many churches involved over subsequent weekends that the Canadian government and media take notice. Be arrested and fined. Make a huge deal about it. Draw international attention to the plight and restrictions. Trust in God to bless you endeavors. Fight for what's right, for the souls of men are at stake! Preterism is a system for the interpretation of the book of Revelation. Its strange name comes from a Latin word meaning "past tense." The word is appropriate because this view holds that either all or most of the book of Revelation was fulfilled in the First Century! Does Revelation infer that its prophecies were to be fulfilled in the time it was written? It would be easy to get this impression because the very first verse in Revelation speaks of "the things which must shortly take place" (Revelation 1:1). Also, two times the text states that "the time is near" for the fulfillment of the prophecies (Revelation 1:3 and 22:10). The principle is one that Jesus stressed in His teachings about the end times. Over and over He told His disciples to be ready for His return at any moment. "Be ready," He warned, "for the Son of Man is coming at an hour when you do not think He will" (Matthew 24:44). Jesus used the parable of the ten virgins to illustrate His point. Five were unready when the bridegroom came and were thus left behind. "Be on the alert, then," Jesus warned, "for you do not know the day nor the hour" (Matthew 25:1-13). On another occasion, He put it this way, "Be dressed in readiness, and keep your lamps alight... for the Son of Man is coming at an hour that you do not expect" (Luke 12:35, 40). The apostolic writers make it clear that living in a state of suspense, expecting the Lord to return shortly, at any moment, will have a purifying effect, because it will motivate holiness. Paul urges us to "deny ungodliness and worldly desires and to live sensibly, righteously and godly in the present age, looking for the blessed hope and appearing of the glory of our great God and Savior, Christ Jesus" (Titus 2:12-13). Peter tells each of us to "keep sober in spirit," and he says the way to do it is to "fix your hope completely on the grace to be brought to you at the revelation of Jesus Christ" (1 Peter 1:13). John says we are to focus on the Lord's return because "everyone who has this hope fixed on Him purifies himself just as He is" (1 John 3:3). Words must always be interpreted in terms of context, and context is often shaped by historical setting. In the First Century setting, the references to "soon," "shortly," and "near" seemed to indicate a quick fulfillment. But as time has passed without any literal fulfillment, history has shaped the context to indicate imminence — that is, the events prophesied can happen any moment. A similar phenomenon can be found in statements used in other portions of the Scriptures. For example, James wrote that we are to be patient until the coming of the Lord, and then he stated, "the coming of the Lord is at hand... behold, the Judge is standing right at the door" (James 5:7-9). In like manner, Peter wrote, "The end of all things is at hand" (1 Peter 4:7). The fact of the matter is that we have been living in the end times ever since the Day of Pentecost when the Gospel was first preached, and the end times could be consummated any moment with the fulfillment of Revelation's prophecies. So, what comes next? For starters, people are going to try to explain away the Rapture with all sorts of wild theories, like possibly Global Warming or UFOs. So-called "Christian" leaders are going to come out and say the Church is still around because they didn't disappear. In Jerusalem, 2 men will appear and preach there for 3 1/2 years that Jesus is the Messiah the Jews have been looking for (Revelation 11:3). 144,000 Jews will call Jesus their Messiah and also preach about Him throughout the whole world. Millions will accept Jesus as their Savior — hopefully you will be one of them. But, many of those millions of believers will be killed by the Antichrist for not pledging their loyalty to him by receiving his mark on either their right hand or forehead. The persecution of believers in Jesus will be awful in the Tribulation (Daniel 7:22; Revelation 7). Those who take the Antichrist's loyalty mark on their hand or forehead will suffer from painful boils. Those who don't take the mark will be cut off from commerce and hunted down, but the Bible assures (Revelation 20:4-6) that those who take the mark have made a decision that will last forever — eternal damnation — so don't take it! The oceans and everything in them are totally destroyed, as well as all the fresh water. The heat from the sun will become scorching. The Antichrist's kingdom will fall into pitch darkness. The Euphrates River in Iraq will dry up and a massive army from the East will cross and enter the Valley of Armageddon in Israel to fight the Antichrist's army. This is what the Book of Revelation calls the battle of Armageddon. Syria, Lebanon, Gaza and other terror-supporting nations have rearmed and are ready to invade Israel. Syria's already moving troops along its border. Unless God intervenes and delays what is prophetically inevitable, the world scene appears to be ready for the 7-year Tribulation; a time Jesus said will be "such as has not occurred since the beginning of the world until now, nor ever shall." In fact, Jesus said it will be so terrible that if it were not stopped at the end of seven years, it would result in the destruction of all life (Matt. 24:21-22). For the believer in Christ, this life change may mean some suffering in the short term, but believers will be spared God's wrath and the Tribulation by first being taken up to be with Jesus in heaven (John 14:1-4; Rom. 5:9; 1 Cor. 15:51-52; 1 Thess. 1:10; 5:9). Because the Rapture of the Church looks so close, I'm releasing a blog entry tomorrow titled "Jesus Came. What's Next?" It is Lamb & Lion's message to those left behind. I encourage you not only to forward and give out as many copies as possible to those you know haven't accepted Jesus as Savior, but you can use it as a "left behind" message using You've Been Left Behind. Now, Jesus Himself made it crystal clear that we cannot know the date of His return. He stated in Matthew 24:36, "of that day and hour no one knows, not even the angels of heaven, nor the Son, but the Father alone." And folks, the season of the Lord's return is now! We are coming to the end of one age and the beginning of the age of Jesus' glorious reign right here on earth. What does God reveal in the Bible that shows us that now is the season of the Lord's return? Well, there are nearly 500 prophecies in the Old Testament and in the New Testament 1 in every 25 verses that describe Jesus' Second Coming. Included in these prophecies God gives us an abundance of signs to be looking out for to know how soon Jesus' return will be. What are these signs? Well, one of the categories of signs to be looking out for pertains to the nature of Society. In Matthew 24:37 Jesus says that His coming "will be just like in the days of Noah." What the Lord is saying here is, "I'm going to come back in a time when the earth is in as bad a shape as it was in the days of Noah." In other words, world society will go full circle and return to being as evil as it was in those days. Genesis 6 describes the days of Noah when mankind's "minds were focused upon evil." In the days of Noah, immorality and violence were everywhere. The Apostle Paul spells it out in detail (2 Timothy 3:1-4), "Realize this, that in the last days difficult times will come. For men will be lovers of self, lovers of money, boastful, arrogant, revilers, disobedient to parents, ungrateful, irreconcilable, malicious gossips, without self-control, brutal, haters of good, treacherous, reckless, conceited, lovers of pleasure rather than lovers of God..." Truly that is the condition of society today. For example, Jesus foreshadowed nuclear weapons in Luke 21 in speaking of people "fainting from fear" due to the "powers of the heavens being shaken," and how people will wish to hide underground to escape the devastation (Revelation 6:15). Daniel prophesied that the Roman Empire would be revived. This began with the formation of the European Union (Daniel 2:36-41). The Bible prophesies a great power located in the "remote parts of the north." This nation will menace Israel in the end times and will ultimately lead an invasion of Israel together with specified allies, all of which are modern day Muslim states (Ezekiel 38:1-39:16). Russia and its Muslim allies fit this description precisely. Satanism in the form of witchcraft, New Age, and the occult were prophesied to become mainstream, and so they have. Paul writes in 1 Timothy 4:1 that "the Spirit explicitly says that in the latter times some will fall away from the faith, paying attention to deceitful spirits and doctrines of demons." And, many churches will become apostate, denying Jesus and ignoring His moral law. Paul writes about those who profess to being Christian in 2 Timothy 4:3-4,"The time will come when they will not endure sound doctrine... and will turn aside to myths." But, the signs are not all bad news. We are told that there will be some very positive spiritual signs in these end times. For instance, Jesus said that the Good News of salvation will spread throughout the world. He said, "And this gospel of the kingdom will be preached in the whole world as a testimony to all nations, and then the end will come" (Matthew 24:14). As a result of all this turning away from God, God will increase the signs of Nature. Natural disasters of every type increasing greatly in frequency and intensity like "birth pains" are God's way of calling people to repent and return to a loving relationship with Him (Matthew 24:8). Jesus stated in Luke 21:11 that "there will be great earthquakes, and in various places plagues and famines; and there will be terrors and great signs from heaven." The prophetic signs that relate to Israel, though, are the most important of all because the Jews are God's prophetic time clock. What this means is that the Scriptures often tie a prophesied future event with something that will happen directly to the Jews. An example can be found in Matthew 24 where Jesus prophesied that the re-establishment of the nation of Israel would be an end time sign. Using the fig tree as a symbol of Israel, He prophesied that when the fig tree re-blossoms, the generation that sees that happen will be the one that will witness His return. Well, the fig tree re-blossomed on May 14, 1948 when the nation of Israel was re-established, making our generation the one that will witness the Lord's return. In fulfillment of this prophecy, the Jews were dispersed from Jerusalem in 70 AD, and they returned in June of 1967, marking this day and time as the season of the Lord's return (Luke 21; Zechariah 8:4-8). Truly, Israel's return as a nation almost 1900 years later is a miracle, proof positive that the Bible is the Word of God and that the prophecies in it have come true in this generation. So why is God giving us all these signs to let us know about Jesus' soon return? Well, the key lies in why He is returning. Jesus is returning to deal with rebellion — sin — before setting up His Kingdom on earth. It is God's merciful and loving nature to let us know beforehand when He comes in justice and judgment to give us a chance to repent. 2 Peter 3:9 explains, "God does not wish that any should perish but that all should be brought to repentance." God deals with sin in one of two ways — either in grace or in wrath. A person is under either the grace of God or the wrath of God. There is no third option. To be under the grace of God is a glorious thing. It means you have the promise that one day soon Jesus will appear and take you out of this world in an event called the "Rapture" before He deals wrathfully with rebellion (1 Thessalonians 4:17). The Bible promises over and over that those who have accepted Jesus as Savior during this age will be delivered from God's wrath. Romans 5:9 says that "we shall be saved from the wrath of God through Him." 1 Thessalonians 1:10 states that we are waiting "for His Son from heaven... who will deliver us from the wrath to come." The promise is repeated in 1 Thessalonians 5:9 — "God has not destined us for wrath, but for obtaining salvation through our Lord Jesus Christ." But, if you're under God's wrath because you haven't ask for forgiveness of your sins and accepted Jesus as your Savior, you will stay behind and experience a wrath unlike anything you can even imagine. This will happen during what the Bible calls "The Tribulation" — seven years when the wrath of man, the wrath of Satan, and the wrath of God will be let loose upon this earth. For seven terrible and terrifying years the Earth will be devastated and billions of people will be annihilated before Jesus' Second Coming. God is a God of love. Jesus says in John 3:16, "For God so loved the world that He gave His one and only Son, that whosoever believes in Him should not perish, but have eternal life." But, God is also a God of justice. The Bible says in John 3:36, "He who believes in the Son has eternal life; but he who does not obey the Son will not see life, but the wrath of God abides on him." It is God's very nature to love, but His love demands that evil be dealt with in justice. Where do you stand? Are you under God's wrath because you haven't accepted His free gift of salvation, or are you under God's grace because you have? Will you be one of those raptured before God's wrath, or will you suffer in it? Can you truly say that you are ready for Jesus' return? You have a decision to make. If you haven't accepted Jesus as your Savior, then heed Mark 1:25. "The time has come...the kingdom of God is near. Repent and believe the good news!" Believe in Jesus, God's Son, and have everlasting life. No two parts of the Bible are more widely disputed than the early chapters of Genesis in the beginning of the Bible and the Book of Revelation at the end of the Bible. Those sections concerning the creation of the universe and recreation of the earth by flood, and Jesus' return to rule and implement our final life's destiny, are scoffed at endlessly. This is understandable, for to undermine God as a Creator and as the Ruler seemingly pushes forward Satan and man's quest for total separation from God's control (which, by the way, God grants in the form of eternal separation, even if people don't like that the destination is Hell). I began writing this with the purpose of providing yet another chink in the argument for those who scoff at the Bible by reporting on a Slashdot.com report titled "Research Finds Carbon Dating Flawed" (September 10, 2008). The report states what I believe most of us already know but some refuse to acknowledge — that carbon dating, whether radioactive Carbon 14 or stable C12/C13, cannot be relied on to give an accurate reading of the age of anything. Such unreliable dating has been proven again and again in animals both alive and dead who have had different body parts tested with the readings resulting in thousands of years of age difference within the same animal. What is more interesting to read are the posts to the report, and what this article is now about. Beginning with the fear that the Intelligent Design supporters would jump all over the dating failure as support for their theory, the posters began an all out blast-fest of supporters of creationism. The rhetoric devolved into accusations that Bible believers are unintelligent acolytes who ignore the "vast amount" of data and scientific organizations that say there is no God and support evolution as "fact." This vehement response to me is not unexpected. I could launch into many arguments myself on why evolution is an unprovable bullet-riddled theory, point to stories of scientists being harassed by their institutions to prop the party evolutionary line, and cite Bible texts that give God's response to the debate. Supporters of evolution and deniers of God have already heard all that, though. What the detractors haven't heard is that Jesus fulfills Bible prophecy. How can one say the Bible is false when it got 108 distinct predictions of Jesus' First Coming dead-on, exactly bulls-eye right? How can anyone deny the signs of the time that point to the soon return of Jesus Christ? What will people say as the 500 prophecies concerning Jesus' Second Coming begin to be fulfilled? Nothing. Bible prophecy being fulfilled silences any rational argument. Bible prophecy being fulfilled proves that the Bible is an accurate record from Creation to Eternity. Period. God and His Word can be trusted as a secure foundation for one's life, worldview and understanding of the cosmos. What I wasn't prepared for was the many venomous emails from those who support the Post-Tribulation Rapture view. The emails may not have come from some or any of the 11 that voted in support of that view, and I'm sure a lot of the emails were generated from the "Christ in Prophecy" show End Time Viewpoints that aired during one of the weeks in August (see below). Never-the-less the source that incited the emails, I've never encountered a group so openly hostile to the Pre-Tribulation Rapture view. Some of the hot tempered emails carried accusations like "the Pre-Trib teachings are straight from the pits of hell," "it's a false teaching," it's "Prosperity Theology" and that "the Pre-Trib is satanically motivated." For me personally, I "just don't get it," need to "wake up," am "afraid," and that my soul is "in jeopardy." I literally will be responsible for "the death of the souls of untold numbers." Wow, and I thought salvation had to do with accepting Jesus as Savior! Why the anger and hostility over one's eschatological viewpoint? 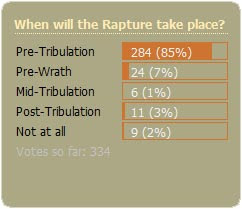 I'll post my theories as to why I believe some so emphatically hold to the Post-Tribulation Rapture of the Church. One, they believe to have a Pre-Trib Rapture would give those who've been riding the fence a second chance at accepting Jesus as Savior. I have heard that repeatedly in a 7th Day Adventist prophecy conference and by the teachings of "Amazing Facts'" Doug Batchelor. It comes across as reminiscent of the "it's not fair" argument kids so often accuse their parents of. And yet, Jesus told us in a story that the wage earner who arrives at the beginning of the shift gets the same payment as the one who arrived near the end of the shift. God isn't always fair in human eyes. Second, I've heard their supporters say that Christians are apostate and evil, and only by enduring a form of "Protestant Purgatory" for 7 years will the Church cleanse itself and be ready for Jesus' return. The end result of the close killing of the entire planet and billions of people being obliterated does little to purify if almost everyone is dead. Third, there is a certain nobleness to being a martyr for Christ; a chance some Post-Millennialists don't want to lose. Even though we are saved by grace, for some they feel works must still be involved, and like some kind of jihadist these kamikaze Post-Tribulation Rapturists want to make the ultimate sacrifice to prove their mettle to God. Terry James, our friend over at Rapture Ready, proposed the fourth answer in his article The Rapture Revilers: "I believe it flows from satanic rage that affects even the born again… I'm convinced it is because Satan hates Israel and the Lord's plan to save remnants out of Israel and out of His creation called man in general… These who hurl invective are deluded, in denial. I don't doubt their salvation. But I do doubt their faithful adherence to God's prophetic Word. They prefer man-made eschatology, and that is given not by the Holy Spirit, but by Lucifer, the fallen one." I agree with Terry wholeheartedly in his saying that we do not doubt the salvation of those who hold to the Post-Tribulation Rapture view. But, the vehemence and anger in which some in that camp support their view is nothing short of satanic anger channeled to divide the Church and throw aside God's promises to the Jewish people. Can't we Christians just all get along? Serving in a para-church organization like Lamb & Lion Ministries, I frequently come in contact with folks who aren't into going to church. They even sometimes write in to ask if it's ok not to attend a church since we are in the end times when many churches are jumping ship doctrinally and falling into apostasy. They use our show "Christ in Prophecy" and literature as a substitute for attending a worship service. They are still dedicated to absorbing as much personal Bible study as possible and watching various Christian TV shows throughout the week, but they will not darken the halls of any congregation. Not going to church, though, is not God's will for your life. I encourage you to join in a doctrinally sound church so that you will have Christian fellowship, accountability and worship — something you can't get with a para-church organization. Without those practices, you will be more open to being led away from Christ. If indeed Christ is the head of the Church (and He is), then as believers that's where we need to be — connected to Him with other believers. As the writer of Hebrews stated in Hebrews 10:25 (NIV), "Let us not give up meeting together, as some are in the habit of doing, but let us encourage one another, and all the more as you see the Day approaching." The Book of Acts is just full of stories of how important gathering with other believers is for spiritual growth and furthering the proclamation of the Good News. Certainly there are churches that are falling away, but there are also many faithful to God's Word. It may take a little work to find one, but you can speed up the search by browsing the church doctrinal statement on their website. If it's not on their website, that's a clear indicator to avoid that place. If you need an example of why following God's will is always in you and your family's best interest, check out this story "Study: Church-Going Teens Have Higher GPAs" by Audrey Barrick of the Christian Post Reporter. Being in God's will by being part of a church affects every single area of your life positively. Other than the economic downturn most of the world is grappling with due to the Sub-Prime Mortgage Crisis, no other topic has been more center stage lately than the energy crisis. Painful fill-ups at the pumps emptying wallets, food shortages ravaging the third world as corn is converted into ethanol, inflation rising as transportation costs are passed onto consumers, and the devaluation of the dollar as the U.S. government mass-prints money to keep up in competitive buying of fuel — all these and many more troubles have befallen the world over the amount of available oil. "Black Gold," "Texas Tea," "Liquid Dinosaur" — the readiness of this substance is the source of troubles in modern world politics. 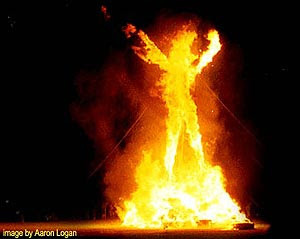 It will also be a huge motivator in the prophetic scenes of Israel overcoming their Arab neighbors (Psalm 83), Russia and Iran trying and failing to seize the Middle East oil fields (Ezekiel 38,39), and the Antichrist's struggle against Israel to control the Middle East to establish his Revived Roman Empire (Daniel 2,7). While the world goes ga-ga over oil, Israel instead has been leading the way in becoming energy independent. With no known oil of their own, Israel knows that currently they are totally dependent on the millions of hostile Arabs intent on destroying them. If it wasn't for God and the greed of OPEC being greater than their Islamic conviction to utterly remove Israel from the face of the earth, Israel would have been reduced to an agrarian society and destroyed by now. Companies like Zion Oil and Gas, Inc., via The Joseph Project have been vigorously drilling for that questionable Israeli oil, believing the Bible supports that Israel is sitting on trillions of dollars underground. They base their search on Genesis 49:25-26; Deuteronomy 32:24; Deuteronomy 33:24; and Job 29:6. These verses speak of "blessings of the deep that lies below" and "oil from the flinty crag" and "let him bathe his feet in oil" and "the rock poured out for me streams of olive oil." Whether oil is under Israel or not, where Israel's true search for energy independence lies is in its brilliant innovations in alternative energy sources like solar and battery power. Israeli scientists have released revolutionary second generation solar cells that are light years ahead of current installs. Israel is also looking to be the first country by 2020 to have eliminated all gas-powered cars with battery-powered cars. Because of Israel's small size, driving distances are well within the current 124 mile battery limit. Israel is motivated to be totally energy independent because it knows it is in a race to survive. The United States and EU, instead of selling out Israel to appease oil-rich Arab countries to keep the supply of oil running, should instead be partnering with Israel in their breakthrough advancements in energy. The United States could indeed be not just energy independent by following Israel's lead and partnering with them, but also become major suppliers of energy to the world and eliminate the woefully unbalanced trade deficit. Unfortunately, as end-time players are nearly ready to fulfill their prophetic roles and fall all over themselves to get Middle East oil, the day the world is free of oil tyranny with energy independence may well have to wait till Jesus is on the throne during His Millennial Kingdom. Pity our short-sightedness and greed. Subscribe to receive the Lamplighter magazine and e-newsletter — it's FREE! "So the LORD God said to the serpent, 'Because you have done this, Cursed are you above all the livestock and all the wild animals! You will crawl on your belly and you will eat dust all the days of your life. And I will put enmity between you and the woman, and between your offspring and hers; he will crush your head, and you will strike his heel.'" "The LORD had said to Abram, 'Leave your country, your people and your father's household and go to the land I will show you. I will make you into a great nation and I will bless you; I will make your name great, and you will be a blessing. I will bless those who bless you, and whoever curses you I will curse; and all peoples on earth will be blessed through you.'" "The scepter will not depart from Judah, nor the ruler's staff from between his feet, until he comes to whom it belongs and the obedience of the nations is his." "Herds of camels will cover your land, young camels of Midian and Ephah. And all from Sheba will come, bearing gold and incense and proclaiming the praise of the LORD." "A voice of one calling: 'In the desert prepare the way for the LORD; make straight in the wilderness a highway for our God.'" A great book that would show you which First and Second Coming prophecies have been fulfilled, broken down into books by Moses, Psalms, Prophets, and the New Testament is the Christ in Prophecy Study Guide by Dr. David R. Reagan. Check it out at lamblionresources.com. When Jesus says He's coming back, He proves it! You are either under grace or your are under wrath. Jesus is coming in wrath. God never pours out His wrath without warning. God is obligated by His character to warn. Therefore, God is obligated to let us know the season of the Lord's return. Now, how can we know it? God wants us to know it, but how does He reveal it? He reveals it through signs — through signs that we are to watch for. The same principle applied to the First Coming of Jesus. In Matthew 16 you will see this principle. In verse 1 we find Jesus teaching when He is suddenly confronted by the Sadducees and Pharisees. Here are the religious leaders of Israel demanding a "sign" to prove that Jesus is the Messiah. They want Him to perform a miracle. He says, "I don't understand you guys. You can look at the sky and tell what the weather is going to be, and you can't look at me and discern the signs of the times? What miracle do you need? What sign do you need besides what I'm doing?" What's Jesus referring to? He's referring to the fact that the Hebrew Scriptures, which these men had been studying all their lives, contain over 300 hundred prophecies about the First Coming of the Messiah. Many of those prophecies are repetitious. If you boil them all down you'll come out with about 109 separate and distinct prophecies about the First Coming of Jesus. These prophecies foretold everything about His life — where He would be born, how He would be born, that He would go into Egypt, that He would live in Galilee, that He would heal people and love people. All aspects of His ministry were prophesied. Take Jesus' lineage for example. It was prophesied that He would be descended from Abraham and Isaac and Jacob and David. The last days and hours of His life were prophesied in incredible detail. The prophets said He would be betrayed, by a friend, for 30 pieces of silver, that He would be lifted up, and that He would be pierced in the side and in His hands and feet. Every aspect of His life and death was prophesied. Now, Jesus is fulfilling all those prophecies before the very eyes of the Scribes and Pharisees. Yet, they are demanding a "sign!" So Jesus replies, "How blind can you be? I'm fulfilling the signs of the times." Now folks, here's the point: There are 300 hundred prophecies about the First Coming of Jesus in the Old Testament, but there are 500 — five hundred! — in the Old Testament about His Second Coming! And in the New Testament, one out of every 25 verses has to do with the Second Coming of Jesus. In other words, there are many, many, many more prophecies about the Second Coming of Jesus than His First Coming. Probably twice as many. Why so many? Because Jesus is returning in wrath. The first time He came, He came as a compassionate Savior with tears in His eyes. But when He returns, He is returning as a conquering warrior with eyes like white hot flames because He is returning to judge and make war against the enemies of God. And so, since God does not wish that any should perish, He has given us sign after sign after sign to watch out for Jesus' return. Some of the most convincing evidence of the Bible's divine inspiration is to be found in its prophecies. More than one-fourth of the Bible is prophetic in nature. Prophecy is one of the most unique features of the Bible. No other book that forms the basis of a religion contains prophecy. There are no prophecies in the Koran, the Book of Mormon, the Hindu Vedras or the sayings of Confucius or Buddha. Consider just two of these remarkable prophecies. In Micah 5 we are told the Messiah will be born in "Bethlehem Ephrathah." That prophecy was given 700 years before Jesus was born in Bethlehem. And notice how precise the prophecy is. It does not simply say that the Messiah will be born in Bethlehem. It says, "Bethlehem Ephrathah." That's because there were two Bethlehems in Israel when Micah wrote — one in the north near the Sea of Galilee, and the other in the south near Jerusalem, in the area known as Ephrathah. In addition to the Messianic prophecies, the Bible is full of secular prophecies about cities, nations, and individuals — many of which have already been fulfilled in history. 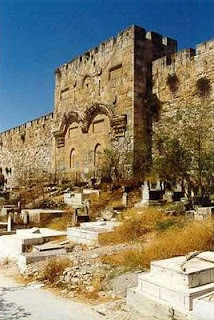 Consider, for example, Micah's prophecy that Jerusalem and its Temple would be destroyed (Micah 3:11-12). This prophecy was written over 150 years before the Babylonians conquered Jerusalem and destroyed the Temple. Micah's contemporary, Isaiah, prophesied that the children of Israel would be taken into captivity, but they would ultimately be released by a man named Cyrus (Isaiah 44:28). This prophecy was written 150 years before the reign of Cyrus who issued the order for the Jews to return home (Ezra 1:1-4). Jeremiah prophesied that the Babylonian captivity would last exactly 70 years (Jeremiah 29:10). Years later, when Daniel discovered Jeremiah's prophecy (Daniel 9:2), he calculated that the Jews were in their 69th year of captivity. Believing that Jeremiah was a prophet of God and that his words were inspired of God, Daniel dropped to his knees and prayed for the fulfillment of Jeremiah's prophecy (Daniel 9:4-19). The next year the prophecy was fulfilled when the first group of Jews were sent back to Jerusalem by Cyrus (Ezra 1:1-4). In like manner, Jesus prophesied that the city of Jerusalem and its Temple would be completely destroyed. As He put it, "There will not be left one stone upon another" (Luke 21:6). Those words were spoken in about 30 A.D. Forty years later, the Romans conquered the city and totally destroyed the Temple. Are you prepared for the answer? For, if there is proof that God exists, you will then have to ask yourself "Am I accountable to God?" If God has laid out some living requirements for life here on earth and beyond, then there may need to be some changes made to your life right now. Read on at your own risk. The first proof we have that God exists is through the book He wrote. Today it's called the Bible. The first line of that book goes "In the beginning God created the heavens and the earth" (Genesis 1:1 NIV). The second proof we have that God exists is that creation itself proclaims it has a Creator. Romans 1:20 (NIV) states "For since the creation of the world God's invisible qualities–his eternal power and divine nature–have been clearly seen, being understood from what has been made, so that men are without excuse." Why not life just sort of happened? That's where the complexity and functional harmony of creation come in. For example, a chicken egg has around 10,000 tiny holes to allow air in and water/waste out. On day 5 the developing chick's heart begins to pump and send out blood vessels to connect to a breathing membrane. On day 19 the growing chick uses an empty spot in the egg for extra air, giving it the six hours needed to use its egg tooth to poke a hole out of the egg. On day 21 it finally emerges. The maturation process of a chick has to develop in order and on the correct days or the chick would never hatch. If the first chicken egg weren't built perfectly, no chickens would be present today. The third proof we have that God exists is that you exist. If God created all things, and you are part of that creation, then you are living proof there is a God. And what a complex creation you are! For example, to produce sound your eardrum moves 1/100th the width of a hydrogen molecule. And that's just your physical makeup. We are so much more complex emotionally and spiritually. The fourth proof that God exists is by a witness, His son, Jesus Christ. Colossians 1:15-17 (NIV) states "15He [Jesus] is the image of the invisible God, the firstborn over all creation. 16For by him all things were created: things in heaven and on earth, visible and invisible, whether thrones or powers or rulers or authorities; all things were created by him and for him. 17He is before all things, and in him all things hold together." The fifth proof God exists is that Bible prophecy is fulfilled. I'm not talking about one or two vague prophecies, but all 108 distinct prophecies made hundreds of years beforehand about Jesus' First Coming were fulfilled. That number is statistically impossible to be accidental. That also proves the 500 prophecies in the Old Testament and 1 in 25 verses in the New Testament concerning Jesus' Second Coming will certainly be fulfilled. You could ignore the proof of God's existence. Maybe even make up your own evidence against and surround yourselves with others who agree and will help quiet those who disagree. Or, you can acknowledge the proof of God's existence, read His book, and learn what awesome plans He has for your life now and afterwards. He leaves it your choice.